Standing astride of the point where the Pacific Ocean and the Gulf of Mexico meet is the natural and graceful rock formation of the Arch of Cabo San Lucas. Baja California is the world’s second largest peninsula. The peninsula helps create the Gulf of California, which is one of the planet’s most biologically diverse seas. Both of these end at the picturesque arch. The limestone Arch of Cabo San Lucas, or known as El Arco locally, is bordered by the Playa del Divorcio on the side of the Pacific Ocean, and the Playa del Amor on the side of the Gulf of California. This majestic arch was carved by potent tidal forces and wind over a course of a millenia. The same tidal forces and winds also make swimming on the Playa del Divorcio dangerous. The arch is an attractive destination for photos for visitors staying in nearby Cabo San Lucas. It is also a popular spot for sea lions to hang around, and has been since long before Cabo San Lucas was a popular tourist destination. The Arch of Cabo San Lucas can be reached by land. Visitors who want to get a closer look and visit the picturesque piece of natural architecture will need to find a boat taxi to board at the Cabo San Lucas Marina. They can even tell the driver of the boat taxi “please take me to Land’s End,” which is another name for the arch. Visitors can also rent a kayak from Cabo San Lucas, and then paddle themselves to Land’s End. The arch has several names, and all of the locals will know what visitors are talking about, no matter which name they choose to call it. The monument is that place where land ends, at “el arco,” near the town of Cabo San Lucas. 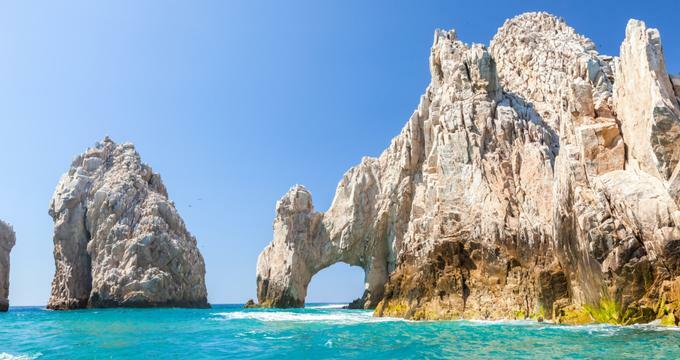 Visitors to Cabo San Lucas can make a day trip out of seeing the limestone arch by spending some time at Playa del Amor, or Lover’s Beach, as well. The secluded beach is a beautiful stretch of sand. The beach and waters offer a chance to scuba dive, snorkel, or simply relax in the sunshine on the sand. Travelers can walk along the shoreline and watch as the natural arch changes color during the sunset. As guests of the beach look out over the water, it’s interesting to think about how pirates once roamed the area during the 1500’s. Pirates would hide behind the area’s rocky walls in wait for incoming Spanish ships carrying gold. Groups of sea lions can be spotted lounging about on the rocks near the Arch of Cabo San Lucas. If visitors journey to the natural archway by way of a glass-bottom boat, they can view the many colors of the abundant tropical fish that call these waters home. As visitors get close to “El Arco,” they should be sure not to miss the perfect chance to take a photography of the arch from the water at the best vantage point.